That's right, we are now on Facebook. So, click on the button and then share us so all of your friends can see how to spend the summer! Click on the Registrations page to have the most fun at the end of the day...! Despite the snow, the wind and the closed roads, summer is coming! And Sail Georgian Bay is ready! Registration is now open and ready for you to book your weeks of fun out on the water. Booking early ensures that your sailor gets the weeks that you want. Spaces are limited as usual. Whether you are a seasoned Level 3 ro 4 or brand new to the sport, you are most welcome and we look forward to seeing you in July. Go to the Registration page or click here to start the journey. Please contact us via email if you have any questions, comments or concerns. SGB wishes you a Happy Holiday and the best 2019! The weather may not make anyone think of sailing but we have rounded the furthest mark; the days are getting longer!! The new Registration page will be up and running sometime in February. Until then, keep the sailors in your family happy with the warm thoughts of the brilliant sunshine while cutting through the waves of the beautiful, clear and clean waters of Georgian Bay! A big thank you from the SGB board to the people who helped out over the summer; the parents, the coaches and, of course, the sailors! We look forward to seeing you again next year. It's never too early to start planning! Our 2019 Registration page will be up and running in February. Until then, remember that "you cannot cross the sea by merely standing and staring at the water"! The Second Annual Team Challenge! Thanks to all the participants and organizers for a great day on the water. Team Sail Georgian Bay were the winners this year with TYC 2nd and RBC 3rd. ​Special thanks to our race committee for bouncing up and down today, Dina on shore, Jeff in the crash boat and to the coaches and students who helped to get all the boats rigged. SGB regatta a great success! Check out the Photo page for the latest and greatest from the Annual SGB Regatta! We still have one more week before the end of the season. Registration is open for the last week!!! We don't want to say that time is running out on this sailing season but, if you planned on your child (or yourself!) getting out on the water for some excitement, skills and good clean fun, then you had best head to the Registration page right away!! Don't have 2018 be the year that you 'meant to' try something new. Do it now! And the sailing just gets better from here on! Traditionally, August on Georgian Bay has better wind than July (even this July has been a good one!) so get your child/teen/yourself registered because the best is yet to come! Are you curious about sailing but never had the opportunity? 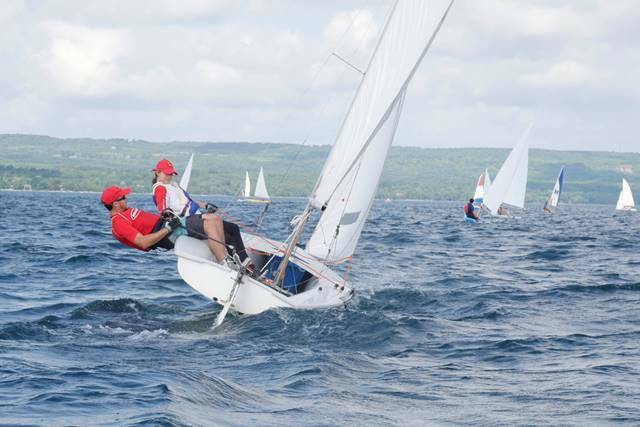 If you have always wanted to give sailing dinghies a try, come on down to Owen Sound's HarbourFest Saturday July 14th! Between 11AM and 4PM, SGB will be at the inner harbour to answer your questions about kids' and adult programs as well as give you some time out on the water. Looking forward to meeting you and your children! Week 1 is done, on to week 2! Please check our Photo Updates page for downloadable group shots as well as other photos taken during the week. The weather has been amazing so far and as the winds pick up, the sailing will only get better and better! Coaches Derek, Aryeh and Ilian look forward to seeing you out on the water! The sun is shining, the water is heating up and it's hot!! So very hot. What better way to spend the day than flying over the water, wind at your back and having great amounts of fun!! The first session starts Monday July 2nd. Check our calendar to see when other sessions run. Registration is still open so go to the link below. Do it now!!! Sign up now for the sailing school that has been called “one of the best venues of Ontario” by Ontario Sailing professionals. Book your child into sailing by clicking Registration today! We are also recruiting instructors and student volunteers. Please email a resume and letter of application to sailgeorgianbay@gmail.com. All of us at SGB would like to wish everyone in our community a safe and happy holiday and best wishes for a healthy and happy 2018. Forgive the shameless plug but do you know what makes a great gift? SAILING LESSONS! It's healthy and active, it's outside, it develops critical thinking skills and nobody sees it coming as a gift in December!! It's the ultimate surprise! We will have the Registration page for 2018 set up in late February but until then, feel free to use this gift certificate to give your favourite person (or people) for the opportunity of a lifetime! Happy Thanksgiving and thank you to all of SGB's supporters! The Sail Georgian Bay 2017 sailing season is over, the boats are away and the docks will be pulled up shortly. It was a wet and unpredictable season but our sailors and coaches made the most of it. 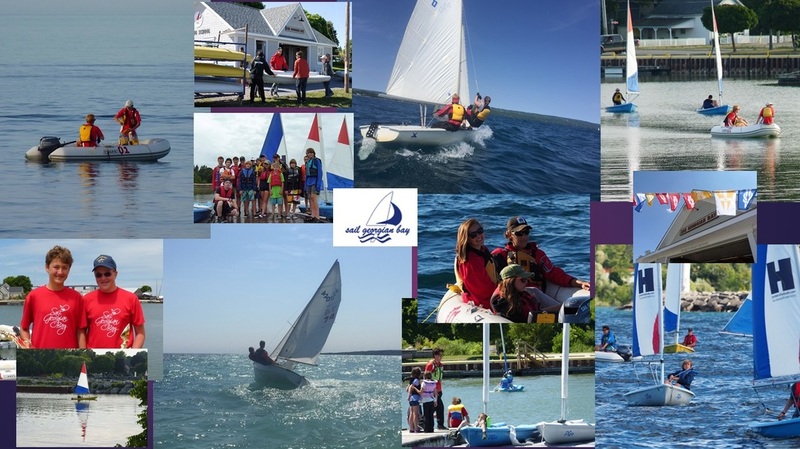 Thank you to those who volunteer their time to make SGB run and stay true to Rhoda's vision of a sailing school in in Meaford (the only sailing school in Grey Bruce!). If you would like to get involved, even in a small way, please contact us. We can always use the help. No sailing knowledge is required, just enthusiasm and the desire to get kids and adults out on the water! Please see the note below about the SGB AGM on November 7th, 2017 and consider attending to hear what's next for SGB in 2018! Sail Georgian Bay runs solely with volunteers. You do not have to be a sailor to be on our board or to volunteer at the school. Everyone has a skill or area of expertise that will contribute to the success of the school. If you or anyone you know would like to help out with this worthwhile cause, as a board member or volunteer, please email us and let us know prior to the AGM. We would love to have your time, your input and your support. Please contact us via email or phone if you would like to get involved! The Annual SGB Regatta is this Saturday!! That's right! It's tomorrow and not too late to sign up! Email or call us or drop by the sailing school to sign up for a full day of fun. The weather looks like it is going to cooperate - warm and windy!! We have made a couple of changes as the end of the sailing season approaches. The SGB 2017 Annual Regatta is now on Saturday August 19th. Please email or phone us to sign up for this fitting end to the racing season. If you are part of the Wednesday Night Racing program, the regatta is free. If you are not part of the Racing Program but would still like to attend, there is a small cost. The SGB/RBC/TYC Team Challenge is on Sunday August 27th. Come out and cheer on the Reef Boat Club and Thornbury Yacht Club members and the SGB coaches as they vie for the trophy and bragging rights!! Changes have been made to the calendar on this website. Hope to see you there! Coach Aryeh brought his GoPro to SGB one day. Not being one to do the 'typical' thing, Aryeh put the GoPro on the top of a mast of a 420! It's a pretty cool glimpse into the day of one of our sailors including turtle-ing the boat!! Week 1 is done! On to Week 2! Check out our Photos page to see all the happenings from Week 1! It is wet out there. We know it and you know it. Do you know what sport is not truly affected by rainfall? Not soccer, not baseball. That's right! SAILING! Whether it's wet or dry, sailors can have fun. Go to our Registrations page to get more information. Or just give us a call or send us an email. It might take us a bit to get back to you because we are out on the water having fun! And we're off!! The 2017 SGB sailing school season has begun! The first day of sailing school was today and it was a beautiful one! Click on the Registration page to join in the fun! Wednesday Night Racing starts this week! Have you signed up? Are you ready to have a couple of hours of fun every Wednesday from 5PM to whenever they finish? It is the a great way to play on the water and hang out with friendly sailors! Go to the Registration page or contact us if you would like more information! It's time to Get Out on the Water!! The warm weather is here! The boats are going in this weekend! The only thing missing is ... you! Still unsure? Come out to Meaford harbour from 4PM to 6PM on Friday June 23rd to give it a try FOR FREE! Our coaches will be there to get you into the boats and having fun! We will also be christening our new Minuet keelboat. Newly donated and freshly refurbished, this boat will be used for our all new Adult Learn to Sail program as well as for our regular 8-18 sailing program! Registration is easy to find and easy to do. Just click on the Registration link at the top of the page. The warm weather is starting...! We are counting down the days to the start of the 2017 SGB sailing season! It won't be long until the coaches are out doing their pre-season warm-up and getting the 420's and Picos into top gear. You will see some boats appear on the SGB docks and then all will be out by the second week of June. SGB Race nights and sailing classes begin the week of July 3rd! Then you are going to see some activity happening!!! Go to the Registration page today and get in on the fun! Contact us at sailgeorgianbay@gmail.com if you have any questions. Registration for the 2017 season is OPEN!! Book your child into sailing by going to the Registration page today! For more information, check out the Our Courses page. To see the fun you can have, check out our Photos page. Contact us via email or phone if you need any additional information. Is this what comes after our 420’s? The US-built UFO has landed, and Billy Black’s video of this excellent little foiler tells you all you need to know about the boat that might just become this generation’s Laser or Hobie 16. It’s got launching procedure (nothing to it), boat creator Dave Clark sailing some basic upwind and downwind, and even a lineup with a Wasp Moth. Click on the image above to see how much fun everyone had last year. Don't miss out! Register today! If you have some time to give, we would love to meet you! Your community sailing school operates on the tightest of budgets, revenue neutral is our goal! Because of this, we rely on volunteers to hang out between 8:30AM and 4PM at our new and improved Rhoda's Boathouse to answer the phone, keep in touch with the coaches who are out on the water and chat with anyone who has questions about the program. It's a great way to spend some time and give back to the community at the same time!! Please let us know if you have an afternoon or morning free to help out Sail Georgian Bay! ​Immerse yourself in the beauty of Nottawasaga Bay in Meaford. Learn more about the area! Working with qualified, energetic and enthusiastic CanSail 1/2 Coaches, you will join our team and help motivate our sailing crew from grassroots to race ready! Our fleet includes Picos, Lasers and 420s as well as a harbour area for beginners and the wide open Georgian Bay to race & challenge the sailors. This position has great leadership potential along with competitive wages and possible billeting. Sail Georgian Bay is affiliated with Ontario Sailing and, through them, with Sail Canada. Our students earn levels in the CanSail system. Check out this link if you are curious about Cansail! It can lead to a lifelong infatuation with being out on the water and looking for great wind!